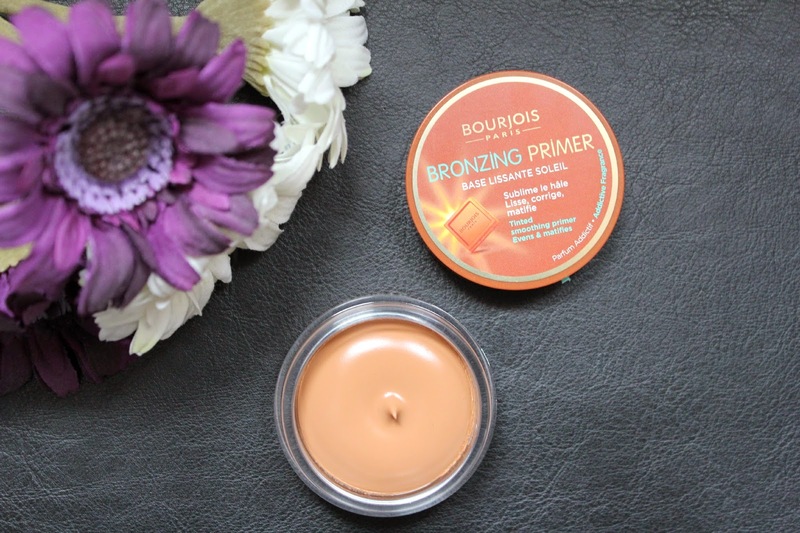 It's pretty rare that I will buy a product on a whim, fall in love with it and then review it within 2 weeks, but just that is happening right now with the Bourjois Bronzing Primer. I don't actually use this as a full on face primer on a daily basis (but occasionally when I am feeling extra pasty it's always an option), but I prefer to focus it on my cheeks, temples, neck, and hairline (basically where you would generally apply a powder bronzer) either over or under my base product, and it just seems to look so natural and seamless. When I wear this, I genuinely can't tell that I have anything on, despite the fact that you can see I am slightly bronzed - it just looks and feel like my actual skin. I was thinking that the texture would be very silicone based, but it's actually not like that. It seems to be a soft, gel-like mousse in the pan, and that kind of works into the skin as well. It just seems to glow from my cheeks, and I have had people *cough* Megan, asking me what bronzer I was wearing whilst sporting this. I have used this every day since I got it, and considering that I had just fallen for the Soap & Glory Solar Powder Bronzer, this stuff must be good. For just under a tenner, this is seriously something I recommend going for if you want a little splurge in Boots. I bought this but still can't decide if I like it or not. I tried to use it to contour but think I need a little more practice, might give it another go tomorrow! Oh this looks great! Sounds like it would be perfect to add a little something to your face, without wearing too much whilst on holiday! The idea of this is so interesting! I really want to give it a try! This looks like a great cheap dupe for the Soleil Tan De Chanel - something I desperately want but can't justify the splurge. This however I could! I can't wait to go pick this up now!! I've been wanting to try this product for ages now! Ooh, never seen this before! Looks interesting though, may have a look when I pop into Boots at the weekend see if they have any testers I can check out :). I love the thought that it gives you a natural glow without looking like you've got anything on!